Imagine this... "hey Chera, I need 5 cards, Halloween, simple. Can you do that?.. Oh and by the way, can you use this?" and a wooden stamp lands on my desk. I took the challenge, used the colors that were requested, and finished in no time. Simple I say.. is lovely. 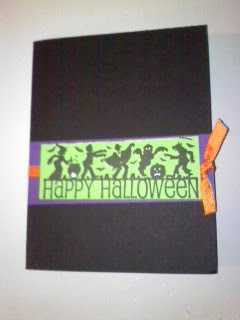 I put the purple/green in the middle for their convenience of writing the cards out. I like it. I wish I could have worked on a few others. That is ok though- I got that challenge completed. 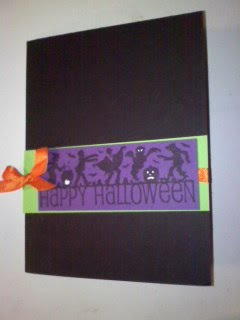 Next I have goodies to make for Halloween party next weekend... and honestly I do not know what to do. I have a few ideas, but its the Hostess gift that I am busting my brain on.